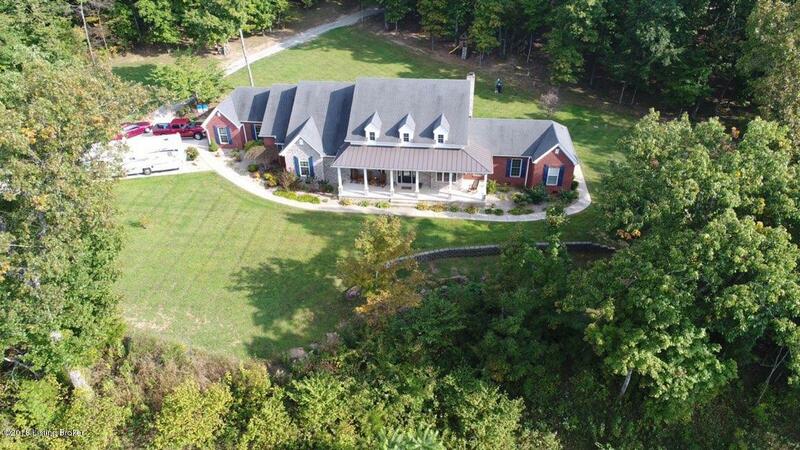 Spectacular Custom built home located on the edge of Historic Bardstown Ky. Much thought was given to the long tree lined driveway approaching the beautiful 2,915 sq ft brick & stone home sitting on 9.34 acres of total privacy. Upon entering the home through the gracious foyer you notice the attention to detail & fine finishes. This home has a desirable floor plan with gorgeous hardwood, tile, & carpet throughout. The spacious living room features a beautiful stone fireplace. The dream kitchen boasts an abundance of cabinetry with a bar & range/stove, dishwasher, refrigerator & microwave remaining. The sunny dining area has plenty of light & several windows. As a bonus, there is an office/library off the kitchen. The master suite is a wonderful retreat with sitting area & bath featuringjetted tub. double vanities, walk in shower & extra large walk in closet. Two other bedrooms, 1 full bath, 1 half bath & laundry complete the interior. There are 2 heat pumps & 2 hot water heaters. Attached & detached garages. Stunning views of nature from all angles. Outside you will find park-like yard with stocked pond & woods. Make this one your Forever Home!